Understanding Your Customer Buy Decision Is Fundamental To Growing Your Technology Business . . . Profitably! It can be very easy to lower your price to secure that order. 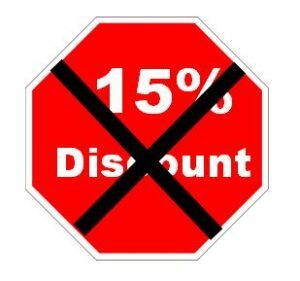 For many salespeople, especially those new to selling technical and engineered products, they see a nominal discount as an easy way to quickly close an order. But is that what truly motivates your customers and prospective customers to purchase your products instead of your competitor’s products? As a technology business consultant, and previously in the corporate technology world, I have sold to engineers, scientists and similar technical decision makers. I have led and been involved in countless sales conferences, sales training sessions and strategic planning meetings. Invariably, when I have asked a salesperson, sales or management team – why are we losing orders or not growing as fast as we should? – a far too common answer is that we are priced to high. To that I typically respond along the lines of – “OK, then if someone recently opened a business out of their garage, claiming to have, say, optical sensors and interrogators that are comparable to yours, but priced 15% lower, would all of your customers and the industry for that matter start purchasing from them?” Of course not. Why then do so many sales people cave too easily on price? Some obvious reasons are the differentiation between your products and solutions when compared to your primary competitors’ is non-existent or negligible. 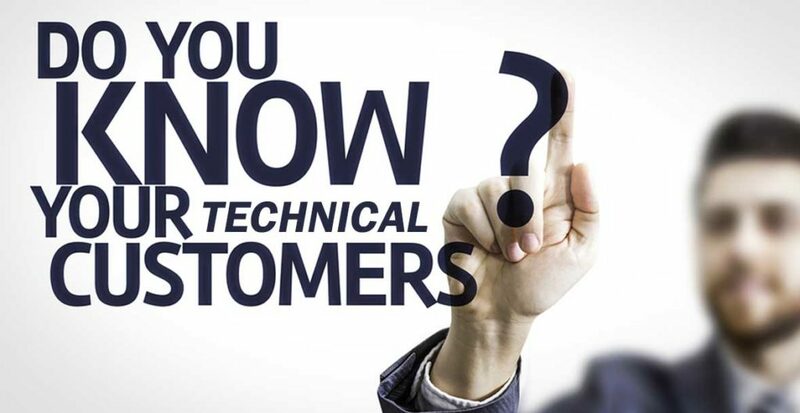 Another reason too often is that the customer has not been fully educated on your technology and the advantages it may have when compared to your competitor’s offering. These purchasing dynamics are part of an overall buying decision process often referred to as the “Customer Buy Decision”. Although applicable to many industries and selling scenarios, it is especially relevant for B2B selling to engineers, scientists and other technical professionals in the aerospace & defense, optics & photonics, electronics, semiconductor, sensor, test & measurement, advanced material, analytical instrument, medical device, industrial & process among other similar technically based industries. Simply put, the Customer Buy Decision (CBD) is :The process, either knowingly or subconsciously, that a decision maker or influencer goes through when evaluating the merits of one technical product and supplier to that of others.. Many variables go into this process but for most technical decision makers involved with technical products, systems or processes, there are five main variables. The more you and your organization are aware of these variables and develops products and strategies to address them, the higher your chances will be to close on more business, increase your profit margins and enhance your chances for consistent, long term growth. Well not quite that simple but your product has to work! For most technical products and applications your product must meet the customer’s and application’s performance requirements. Whether it is; temperature or temperature range; elevated pressures or high vacuum; optical or electrical properties; response time; differential pressure; tension, compression or torsion; vibration or shock; materials of construction, coefficient of thermal expansion, hardness or tolerances; corrosion resistance; lubricity; radiation hardened; envelope dimensions and weight; accuracy; cycle time; strength to weight ratio or a myriad of other performance variables, your product or system must perform in the intended application and operating environment. This is not only a variable in the Customer Buy Decision but is a prerequisite to even be considered as a possible solution. It gets you in the game. Certainly data sheets and other marketing collateral help but engineers and scientists will tune you out if you try to dazzle them with fancy sales pitches and materials. They want to see the data and then they will make their decision on their own. They rarely can be “sold” to. No sizzle here, only the steak please! For established products – testimonials and references from others with similar applications, an installed base listing; test data; before and after scenarios; industry leading warranties and similar sales tools will go a long way to establishing you as a market leader. This will also enhance your (greatly over used phrase) “value proposition”. But don’t use those words as they are a turn off for many technical decision makers. Let your data, results and experience do most of the talking. For those firms entering new markets with a new solution, establishing credible performance capabilities for your product is incredibly more challenging. With little experience and name recognition use white papers to document lab and field test results and offer sample prototypes (depending on the product) for evaluation. These and other strategies are necessary to gain traction. But this is a subject (product development, new technology commercialization & new market development) for a future article. A side note here. 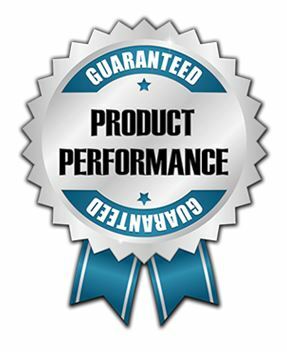 Another common phrase I hear from organizations and sales personnel with regards to product performance is “our product’s performance capabilities will exceed your expectations.” Although a catchy (but overused) phrase it can box you into a corner. If I require a product that needs to perform from –55OC to +125OC (full military use for electronic COTS parts) but you have a product that works up to 350OC that is fine but am I going to pay more for that capability when I don’t need it? Probably not. This is the difference between what a customer wants vs. what a customer needs. They will be interested in what you have but are typically only willing to pay for what they need. As such, be careful not to design products that far exceed what the application requires (assuming the development and material costs increase accordingly) as it will be harder to meet your profit goals. Your product works, great! It meets your customer’s performance requirements and performs well in the application’s intended environment. Now it has to reliably work day in and day out, 24/7/365. Product reliability is the second important variable in most technical Customer Buy Decision processes. Product reliability can be defined in many ways depending on the product or system and the application. It may be defined by minimum cycle times, number of years in operation, uptime percentage or % uptime, mean-time-between-failure (MTBF), or to-repair (MTTR) or between-planned-maintenance (MTBPM), etc. For many technical components or sub-assemblies, it must reliably perform throughout the entire life of the system (OEM) it is specified into unless it is a consumable item. You don’t want your product to be the weakest link in the system’s operation. An industry leading, or at least standard warranty is paramount. For a processing system/capital equipment such as a deposition or etching system in the semiconductor industry, the system is only reliable if it works day in and day out. But equally if not more important, it must reliably and repeatedly meet the processing specification, either continuously between scheduled chamber cleans or from batch to batch. And, as applicable, including established and documented process specs written into the purchase agreement will further establish you as an industry leader with proven products or systems. What Have You Done For Me Lately? You’re Only as Good as Your Last . . . . . Your product meets the customer’s performance requirements and it reliably performs day in and day out. But . . . . . eventually . . . . . something in your organization may fall through the cracks. This could be a late delivery, a quality issue, a hiccup in a scheduled maintenance call, a product out of tolerance, etc. When this happens, and it will, your organization’s willingness and capability to respond quickly to correct the issue could be the difference between solidifying a long term supply agreement or opening the door for a competitor. Even good companies stub their toe, but the good companies also recognize this as an opportunity to turn a negative into a positive. By explaining to the customer what happened, wowing them with your response to fix it and then putting the proper checks and processes in place to prevent it from happening again will resonate with your customer. A supplier’s total service capabilities is the third variable in the technical Customer Decision Making process. Total service variables certainly include the aforementioned and obvious big items such as quality and on-time delivery. But other common organizational characteristics that may factor into your complete service solution include; consistent and short lead times for standard products; quick turnaround quotes on custom products; proper and continuous training of sales and customer service personal such that they provide customers with accurate and timely information on the product(s), order status and your organization’s capabilities; availability of local (to the customer) support, either direct or through a channel; availability of information on your website; and the ease of purchase (one click shopping where applicable, the Amazon effect). Even sometimes the most basic customer service attribute can differentiate you from your competition. One example is something as simple and relatively easy as not losing customers and prospective customers in a maze of automated phone prompts only for them to get voicemail . . . . and completely frustrated. If it hasn’t been done already, I think I’m going to trademark the tag line – ACME Corporation, “We pick up the phone”! The Inevitable Price Dynamic, But Is It Really Price? Yes, price is very important and is typically the forth variable in the technical Customer Buy Decision. When sales personnel complain prices are too high the customer or market is communicating there is little discernible difference between you and your competitors on product performance, product reliability and total service capabilities. As a result, with all other variables being very similar, the determining factor has now come down to price. Obviously an organization wants to minimize this dynamic unless your business model is one of lowest price. For most organizations, if you arrive at this stage in the sales process, then it is the sales person’s responsibility to adequately educate the customer on their product’s and organization’s advantages that are of value to the customer. It is also paramount that the message conveyed doesn’t focus on price but on total Cost of Ownership (CoO), sometimes referred to as life-cycle costs. This is the full cost for a customer to use your product or system and generally includes; cost and time to purchase (think individual orders vs. blanket supply agreement); delivery costs; costs to start up a system or incorporate a product into an OEMs piece of equipment; maintenance costs; and where applicable, the cost to decommission a piece of capital equipment. I have always been of the belief and taken as my responsibility that it is marketing’s job to make the sales person’s life easier by developing and providing them with the necessary tools to succeed and not have to resort to dropping prices. Otherwise it quickly becomes a race to the bottom with your competitors (who will also drop their prices to protect market share) resulting in a substantially reduced opportunity for profitable sales. This leaves us to the final major variable in the technical Customer Buy Decision but no jokers here if you want to close an order. The wildcard in the technical Customer Buy Decision process is relationship or sometimes referred to as incumbency (for existing customers). Bottom line, customers (people) like doing business with people they like. In business, customers like certain suppliers because they can trust them. Trust them to provide proven and reliable products. Trust them to deliver on time, every time and trust them to resolve a problem quickly and effectively when one occurs. If a company continually does this for the majority of their customers over the long term they will earn the trust (and business) of more customers and potential customers. Many people refer to this as “brand”, but be careful here. Remember that engineers, scientists and other technical decision makers don’t like to be sold to. Although “brand” is a popular sales and marketing term, it is often more associated with consumer products. The comparable term in technical markets is reputation. A brand may be established by snazzy marketing and large investments in advertising, etc. But, a good reputation can only be earned. A good reputation has value, and assuming it is better than your competitors’, you can charge a nominal premium for this additional value. If a supplier has a solid relationship with a customer, is specified into their systems (OEMs) or process, and is entrenched in their supply chain it will be nearly impossible for another supplier to take their business (high switching costs). Think of it in terms of a heavyweight boxing fight. The reigning champion rarely loses a fight by decision, they have to be knocked out by the challenger. Relationship or incumbency is considered a wild card because its importance and impact can vary across markets, applications and specific supplier-customer scenarios. For established markets with established solutions dominated by a handful of leading suppliers, relationship or incumbency may not carry much weight because “switching” costs may be low – dynamics typically found in mature markets. Think traditional 25 mm diameter, band pass filters in the visible range with high transmission and sharp cut-ons and cut-offs. For emerging applications or technologies in a dynamic industry segment the wild card generally moves up the importance scale. If a company has a poor reputation on customer service they will need to develop an extra-extraordinary new product with far superior performance capabilities and high cost-to-benefit ratio to be given consideration in the buy decision. Conversely, if a company has a stellar relationship, it may be given a little latitude (second chance) if it is late on a delivery or one of their products prematurely fail. In both of these cases, the wild card of relationship, incumbency and/or reputation will move farther up the decision making list of variables, possibly #1. For us veterans, think back to the 1980s phrase – “no one ever got fired for buying IBM”. If you recall, IBM was growing tremendously with higher profit margins than others in their market. Their stellar reputation earned them the advantage of not having to compete on price as much as their competitors. Going back to where we started – dropping your price by 15% to close an order is not too difficult. But having to do it repeatedly over a long period of time to close on orders can be very painful. It may be a red flag that there is a disconnect between what your markets need and what you are offering. 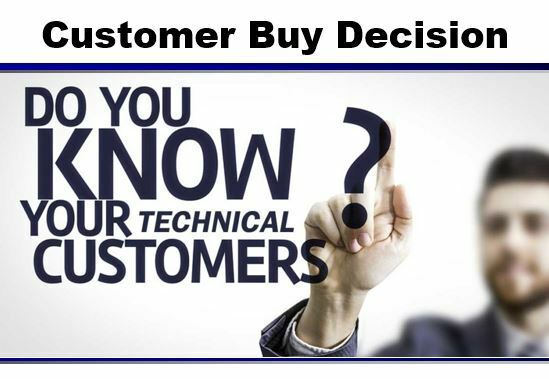 Better understanding your technical Customer Buy Decision process and the variables involved will enhance your opportunity for increased profits and long term growth. David Klein is a Principal Consultant with TekMark Growth Partners Ltd. (www.tekmarkgp.com). TekMark is a leading technology, marketing and strategic management consulting firm. We help technology and engineered product based companies grow with proven programs in new business & new product development, SBIR technology commercialization, channel management, technical research, competitive analysis and strategy. Our technical experience in the medical device, scientific instrument, aerospace, semiconductor, electronics, optics & photonics, advanced materials, sensor, T&M and similar technical markets enables our clients to quickly and effectively develop new growth opportunities.